Unicorn's Garden 1E | First Edition 1E Ponies Figurines | One Price Low Flat Shipping! From the Trail of Painted Ponies First Edition 1E Serial Numbered Collection, Unicorn's Garden. Made of resin. Measures 6" tall. This is a first edition Unicorn's Garden painted pony model. These highly collectible versions are from the first production run manufactured, which is indicated on the bottom of the pony's base with the "1E" prefix before the hand-written serial number. 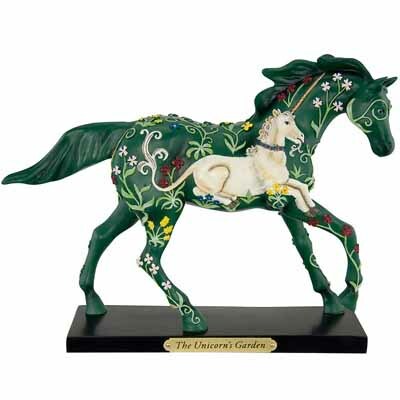 Great addition for the elite Trail of the Painted Ponies collector! In the 16th century, in the Netherlands, a series of fabulous tapestries was created, each featuring a unicorn â€“ that mysterious and beautiful white, horse-like creature with a single horn extending from its forehead â€“ in a magical setting. These tapestries were of such breathtaking magnificence that since that time they have been displayed in prestigious museums around the world. Inspired by one of these tapestries, The Unicorn's Garden depicts a unicorn resting in a glorious paradise-garden, surrounded by magical plants and flowers.